Learning about Bald Eagles and Barn Owls is one thing. Witnessing a live demonstration with the birds of prey a few feet away is a fowl of a different feather. The audience at Thursday night’s environmental education presentation in Baxter 101 experienced both scenarios. Wilbur opened her presentation by removing Friar Tuck, a Crow, from a set of cages located near the closet of Lovell Lecture Room. 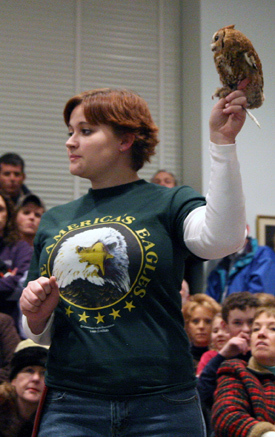 She explained the bird’s vulture-like tendencies to consume road kill as well as its role at the American Eagle Foundation. "We named him after the character in Robin Hood because he takes from the rich humans and gives to the poor eagles," Wilbur said, with the black bird gripping her fingers. "People come up and hand him dollar bills, and he takes them, tucks them into his little green box, and then he gets a treat. He has brought in more donations than we’ve ever had every season because he’s so adorable." The Birds of Prey presentation was conducted by staff members of the American Eagle Foundation, a non-profit organization based in Pigeon Forge, Tennessee dedicated to protecting the Bald Eagle. The program was coordinated by Gina Bowman and Jerry Bowie of the Center for Academic Enrichment, and it is the first event of the semester organized through the Experience Indiana Speakers and Artists Series. The presentation featured information about and demonstrations by a wide range of birds, including owls, eagles, falcons, hawks, and vultures. Information about some of the birds dispelled common myths. "There are lots of stories about owls," Wilbur said, just after replacing Jupiter, a brown large Barn Owl, back into his cage. "You’ve all probably heard of the wise old owl. Well, sorry to break this to you, but owls are probably the least intelligent bird you are going to see up here today. Their eyes are so big that there is little room for a brain. They are smart enough to survive. But that’s about it." Information about other birds confirmed what some people may have already assumed. Dickerson moved around the room so the audience could observe Jesse, a Red-Tailed Hawk. She described the species as exceptional hunters, assisted by incredibly sharp vision. "They can read fine print on a newspaper for up to a mile away," Dickerson said. "They can see a rabbit running up to two miles away." Despite the competition, the final fowl of the show, a Bald Eagle named America, refused to be upstaged. In terms of story and interaction, he stood out above the rest. He was born during a time when there were only 417 pairs of bald eagles in the contiguous United States. He was first found in Michigan injured by a gunshot wound to the wing. After being nursed back to health and returned to Tennessee, he was later found starving in Missouri. Now he’s part of the American Eagle team. America’s size and majesty commanded the audience Thursday night. His claws were attached to a lash because he attempts regularly to flee his trainer. His piercing stare and strong, wide wings and body hovered in the air above Wilbur as she waited patiently for the show’s star to cooperate. She finished the story by recounting her visit to the Lincoln Memorial when Bald Eagles were taken off the endangered species list, with almost 10,000 pairs now in existence as a result of preservation legislation. "We are very proud of this little boy right here," Wilbur said affectionately. "And this our nation’s living symbol."